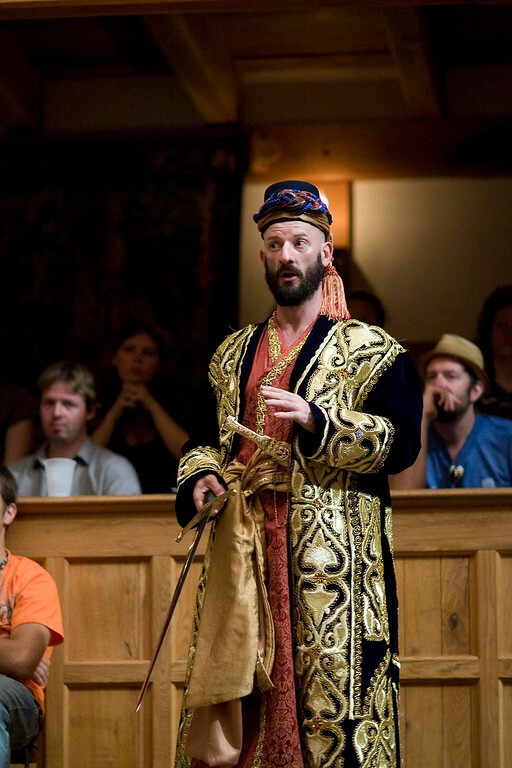 Jonathan Reis in THE COMEDY OF ERRORS. Photo by TOMMY THOMPSON. 2009. 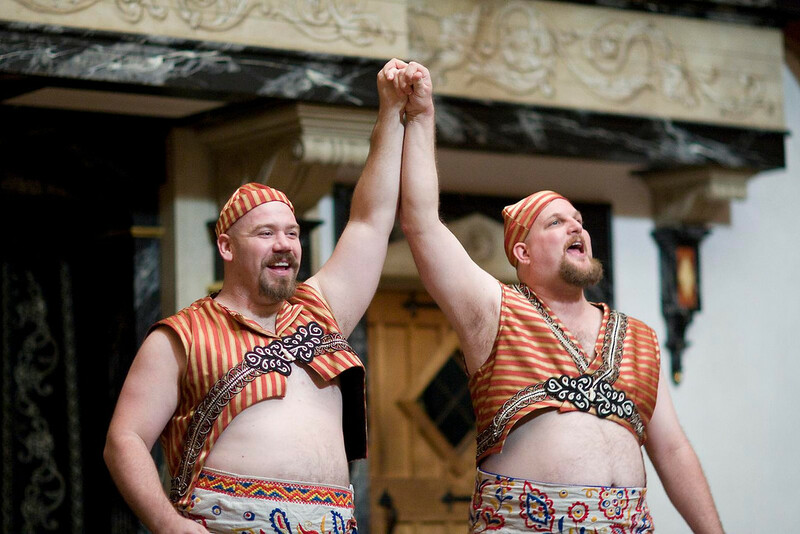 Dennis Henry and Josh Carpenter in THE COMEDY OF ERRORS. Photo by TOMMY THOMPSON. 2009. 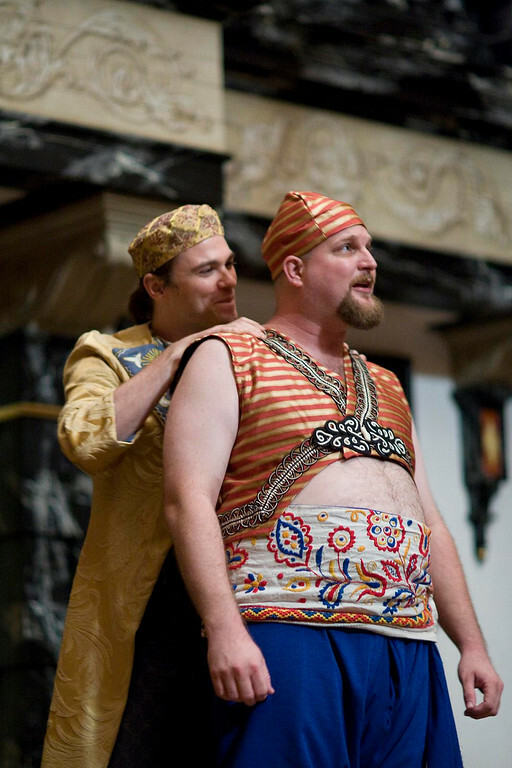 Josh Carpenter and Ginna Hoben in THE COMEDY OF ERRORS. Photo by TOMMY THOMPSON. 2009. 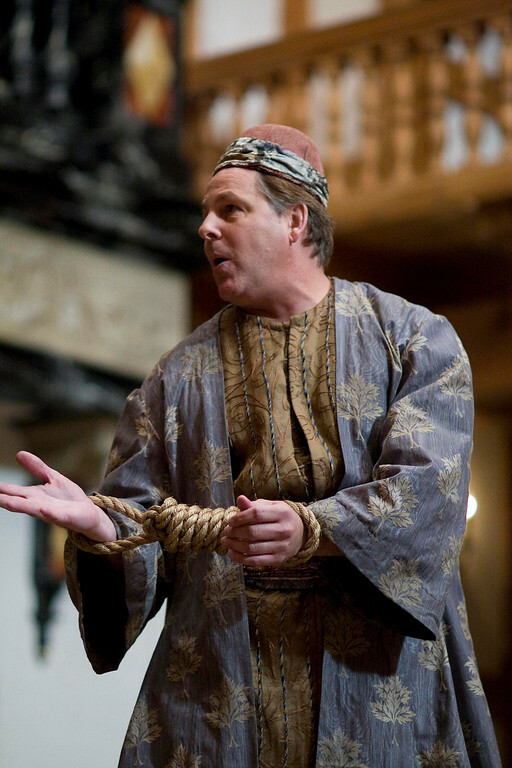 Daniel Kennedy in THE COMEDY OF ERRORS. Photo by TOMMY THOMPSON. 2009. 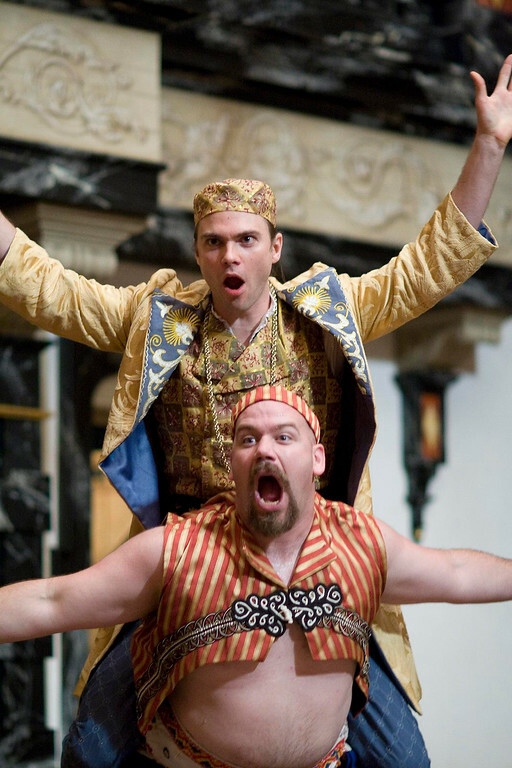 Josh Carpenter and Dennis Henry in THE COMEDY OF ERRORS. Photo by TOMMY THOMPSON. 2009. 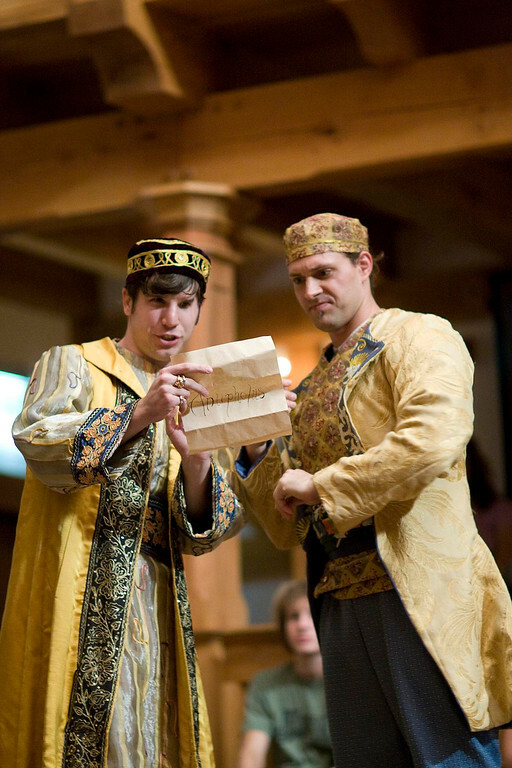 Aidan O'Reilly and Luke Eddy in THE COMEDY OF ERRORS. Photo by TOMMY THOMPSON. 2009. 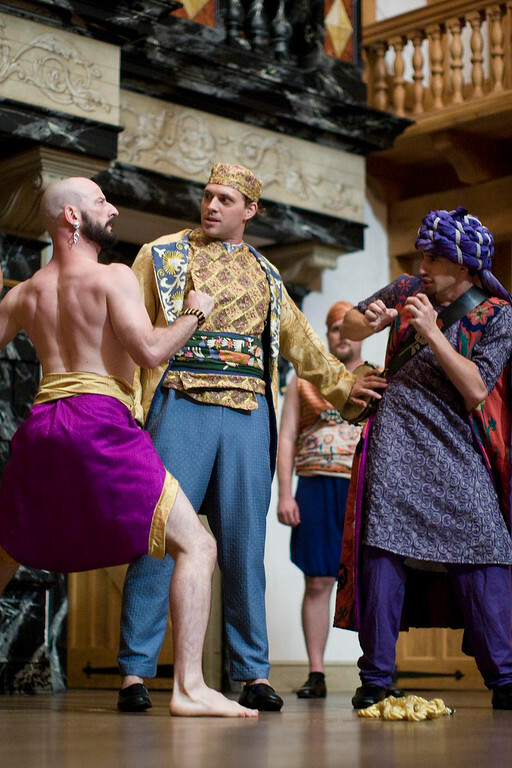 Daniel Kennedy, Luke Eddy, and Aidan O'Reilly in THE COMEDY OF ERRORS. Photo by TOMMY THOMPSON. 2009. Ginna Hoben and Brandi Rhome in THE COMEDY OF ERRORS. Photo by TOMMY THOMPSON. 2009. 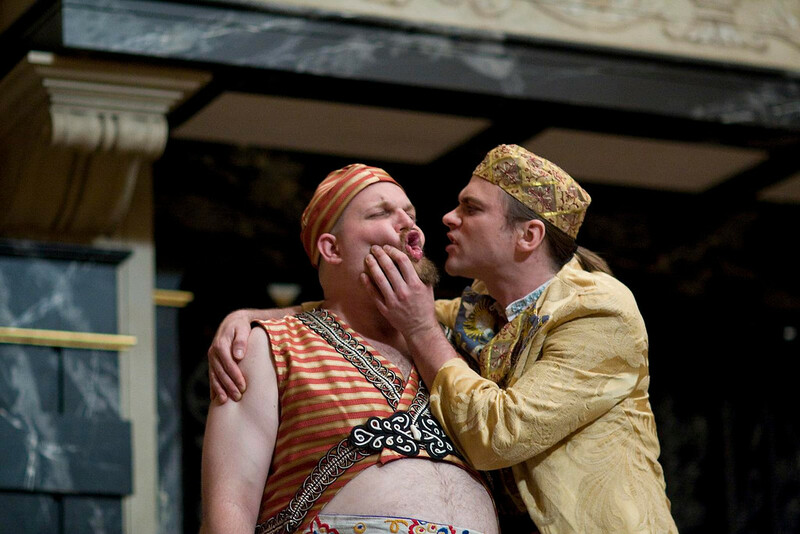 Rick Blunt and Dennis Henry in THE COMEDY OF ERRORS. Photo by TOMMY THOMPSON. 2009. 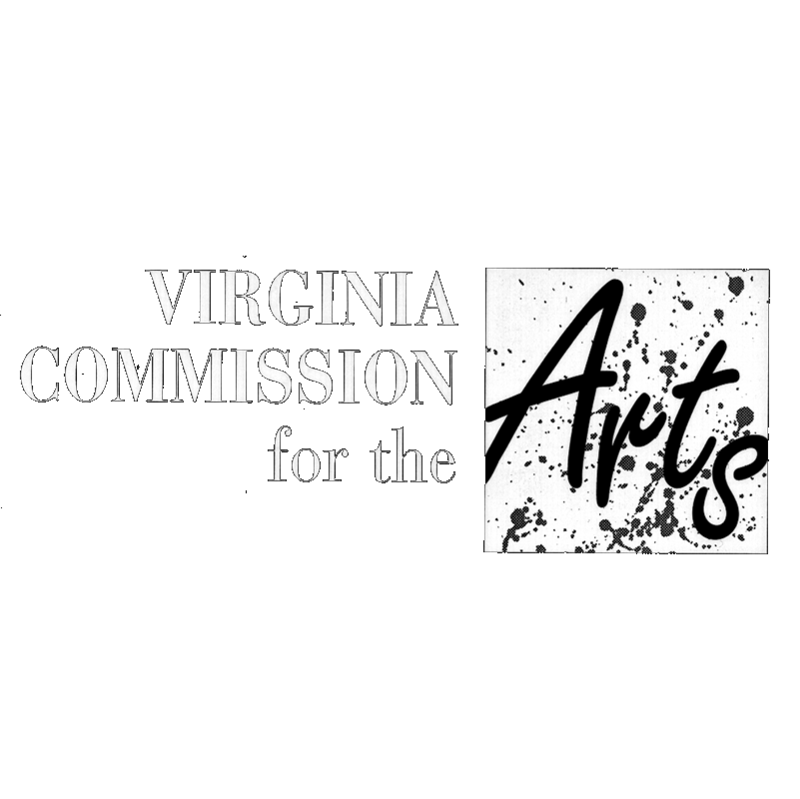 I am delighted to be returning to Staunton to direct The Comedy of Errors. It’s Shakespeare’s most farcical play and his shortest. Like a juggler he weaves together three old stories, filled with the most outrageous coincidences, and manages to keep all the balls in the air, without dropping them. Two pairs of identical twins, unaware of each other’s presence, roam the streets of Ephesus, causing mayhem and confusion as they all get mistaken for one another with hilarious consequences. “Mistaken Identity” is one of the prime sources of comedy and in this play “mistaken identity” is piled on more “mistaken identity” until it reaches dizzying heights. So, lots of fun, lots of craziness, but totally improbable – right? Well, no; not totally improbable; at least, I don’t think so. It took quite a few moments to convince this friendly chap that he didn’t know me and that I knew no Susan. I clearly must have looked very like the man he thought I was. On reflection I realized I had somehow been complicit in the confusion, because my initial reaction had not been to think that he had mistaken me for someone else, nor did I think that he was deranged in any way; no, my initial reaction had been that there must be some logical explanation to it all. Our “mistaken identity” could have lasted much longer. It only needed me to have the faintest of suspicions that perhaps I did know this guy, but had just somehow forgotten who he was, and if I had also lacked the courage to confess this, we could have well ended up, saying we must meet up in the intermission, when we would have no doubt continued to converse about the missing Susan. Most of the time such confusions are short lived; only occasionally do they have an extended life and then the results, especially when they happen in plays, are “wildly funny.” And yet there is a suggestion in the phrase that laughter frequently flirts with dangerous situations. And that leads me to another odd moment that happened at this same theatre in East Anglia all those years ago and which, until I was writing this, I never connected before with my moment of “mistaken identity.” And this one was a bit scary. I was standing at the back of the auditorium and saw a man seated down towards the front of the stalls and I thought that, from behind, he looked rather like me. I walked down to get a closer look, expecting at any moment, as I saw more and more of his face, that he would suddenly look quite unlike me and that then, I suppose, I’d be reassured, and that would be that. But no – the more I saw of him, the more he looked like me and then, as I got almost level with him, I panicked, turned on my heel and walked away. It’s the other side of the coin: look-alikes are funny and disturbing. What I now think, after a gap of thirty years, is that I had seen sitting in the theatre the man who I was to be mistaken for some months later. One of the other well-springs of comedy is the rule of three. Three things in a row are often funny. So I have to tell you three true tales. This one is about a coincidence. Not so long ago, my brother and I spent a day traveling around London on our new bus passes. We’d made no plans as to where we were going, we caught a bus, then another, and so on, and ended up, as chance would have it, having lunch in Golden Green, many miles from home. My wife that day was going to have lunch with a friend; where I didn’t know. But as my brother and I finished our meal, and walked out into the street, we walked straight into her. This in a city of 8 million people! An extraordinary coincidence – it all depended on incredible split second timing on all our parts. How did it happen? I don’t know. But it was such a happy happening, that I’m still happy that it happened. One thing’s clear: our happy coincidence wouldn’t have happened if she’d stayed home all day. So it is with The Comedy of Errors: the father who is searching for his lost children, the brother searching for his lost brother – well they certainly wouldn’t have found anyone if they’d just stayed in doors moping. Perhaps in order for something to happen you have to get out of the house and make something happen. So I think it’s a good thing you’ve all come out to the theatre today; you never know, but the happy unexpected might just happen.